Rain showers! Almost EVERY day! It's been a really, really busy, busy summer! Trying to fit everything in-between the rain showers has really cramped our style! Oh well, the humans have been really good about including me in things. I met a really neat Westy one day and had a great walk and talk with him while the humans walked and talked. Yesterday I met an old guy and he wasn't too much fun...guess I'll be like that when I'm old. Hmmm. 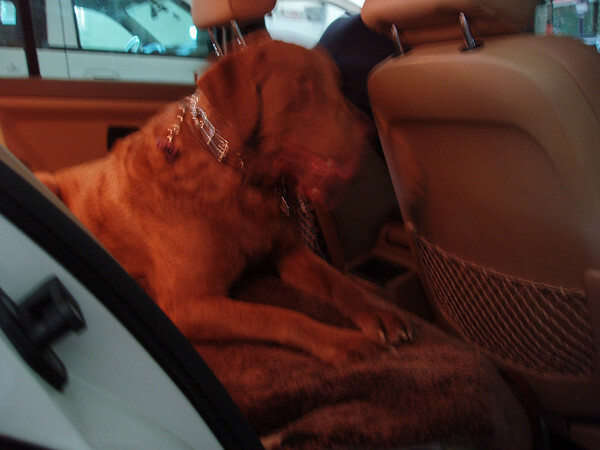 Anyway, I've grown up enough that I get to ride in the people mobile with the humans now. I could never ride there before because my crate wouldn't fit and I wasn't allowed to ride unless I was in my crate. I've learned I have to sit or lay down in the car. It's neat because I get to put my nose up to the window and it is cracked open so I can get all the passing smells! Here's a picture of me in the people mobile waiting to go! Below we are resting along the creek. When we go to town now I get to run loose in the field and play aeroball. I love that it! I love it so much I don't even care about the other dogs around! That's cause I'm a retriever!